Our brand new Îles d’Or® mobile homes (2 bedrooms / 4 guests): a Premium rental choice in the Var region, Provence-Mediterranean! Set amid luxuriant vegetation, on 170m² wooded plots, discover our new Premium accommodation, designed exclusively for Camping de La Pascalinette®! Welcome to the Îles d’Or® mobile homes, offering quality services for a peaceful camping holiday in the South of France. Enjoy a camping holiday in the Var region, Provence-Mediterranean with all home comforts – and maybe more! No more heavy luggage: bed and bathroom linen is supplied, together with baby equipment (simply book a bed + high chair)! You’ll have everything you need to start the day with a great breakfast: a capsule coffee machine, toaster and electric kettle. And because sleep is precious, the air-conditioning will allow you to recover from your fun leisure activities at the campsite, beach excursions and tours around the Var region and Bay of Hyères. 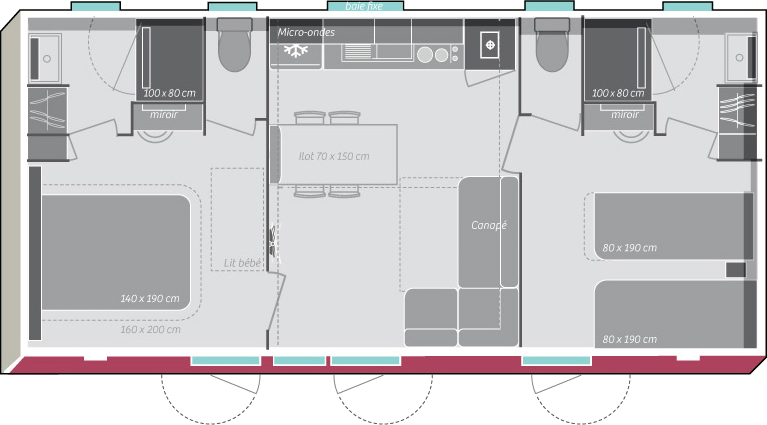 The master bedroom with a 160x200cm bed offers genuine VIP comfort! No stress when it’s time to leave: cleaning is included free of charge in your stay. And to make the most of your holiday in the South of France, Provence-Mediterranean, we can also clean and change your sheets for you during your stay on request (supplement payable). You will love cooking on the gas plancha out on the semi-covered terrace decorated with flower boxes, enjoying a relaxing outdoor meal, revelling in the South of France sunshine on the sun loungers, or laying back in the hammock. Premium accommodation for a deluxe camping holiday at Camping de La Pascalinette® in the South of France, Provence-Mediterranean, complete with a 1873m² water park!